The more complex the mechanism and the more elaborate the design, the better. Discerning watch devotees will recognise that credo. It was one that informed my early years in the watch trade – until 1997, when I met Ludwig Oechslin. He was well aware of the prevailing bias towards complexity. It was this that prompted him – the mathematician, astronomer, master watchmaker and designer – to pursue an alternative direction. One that was subject to the same standards you would find in architecture, art and product design – but not watchmaking… yet. 2003: “The weekday, month and date indicators are all on the same line; it’s an annual calendar comprising just nine components.” Over an espresso, Ludwig was rattling my cage at a time when I still harboured certain conservative notions as to what constituted a desirable watch. It would be impossible to house such simplicity in a great watch – surely? The market was teeming with classic interpretations. There had to be a design that would match the rigorous mechanism. Industrial design was the answer. Instead of adapting an existing design, it would need to be a watch that showed its true character – a strong, rigorous concept. I immediately grasped what it was Ludwig had in mind. “The watch sports a rigorous design. It needs a rigorous price – CHF 5000,” was Ludwig’s recommendation. The International Watch Museum MIH concluded an exclusive deal with Embassy and agreed that there should be no advertising. Buyers of the MIH Watch aren’t paying for the innovative mechanics of its annual calendar: Ludwig published his designs for the nine components as an open source resource, and in so doing released the financial brakes that could have scuppered the project. The MIH receives CHF 700 for each MIH Watch sold by Embassy – money that’s invested in its restoration projects. This was Ludwig’s way of creating a novel source of funding. So what exactly does 9 September 2005 represent for Ludwig? On that historic day he joined me in launching the MIH Watch. Historic?? On that Friday, Ludwig presented a concept that functioned on his wrist exactly the way he intended it. His thinking, though, had moved on. He was ruminating on the practicalities of providing a large date and on the doubtful aesthetic proportions that resulted from its implementation. While explaining the single-line date indication of the MIH Watch to his audience at the launch, in his waistcoat pocket ticked the first prototype of the anno cinquanta, with its three calendar components and lack of alphanumeric characters. An intuitive time horizon. He couldn’t show it right then: he had to content himself with thinking about the best form of display. Seen in that light, the MIH Watch is a prototype for an even better idea – better because it’s even simpler. It signalled the start of a process that now involves both of us and others under the ochs und junior banner. 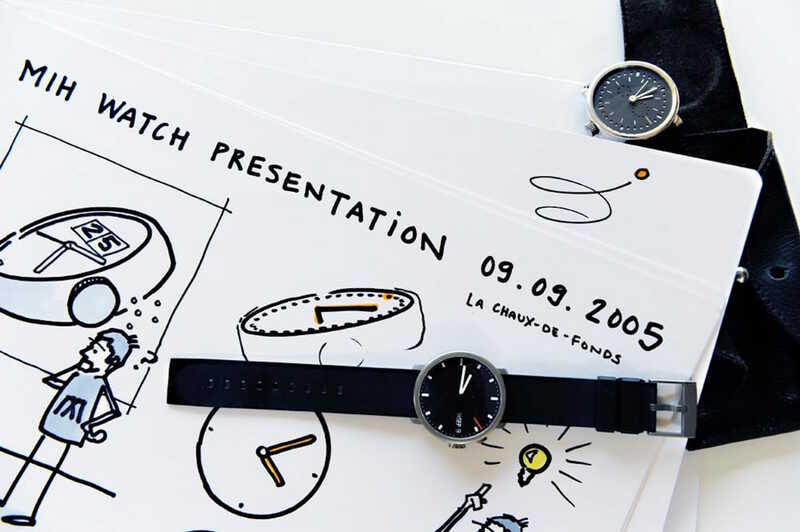 The ochs und junior project does not have the industrial design image of the MIH: as a concept it’s whimsical, almost romantic, and it incorporates far more products – concept watches, one-offs, experiments and timepieces that are the direct result of Ludwig’s solutions. The MIH Watch was launched exactly five years ago – each one is built at Paul Gerber’s workshop. Today is a chance to think back and go over what we’ve learnt. It’s an exciting time!